Veteran long distance runner, Anuradha Indrajith Cooray will be the overall captain of the ten-member Sri Lanka contingent for next month’s Olympic Games in Brazil, with Secretary General of the National Olympic Committee Maxwell de Silva accompanying the contingent as the Chef-de-Mission. This will be the record third Olympic Games for the UK-based Lankan marathon runner, having represented Sri Lanka at the 2004 Athens and 2012 London Olympic Games. He holds the Sri Lanka national records in the men’s marathon (two hours, 13 minutes, 47 secs) and half marathon (one hour, 4 minutes, 45 secs). On his Olympic debut in the Greek capital 12 years ago, Cooray was placed 30th out of 113 competitors with a timing of two hours, 19 minutes and 24 seconds. Out of 101 marathon runners who faced the starter’s orders at the 2012 London Olympics, Cooray managed to finish 55th in 2:20.41. 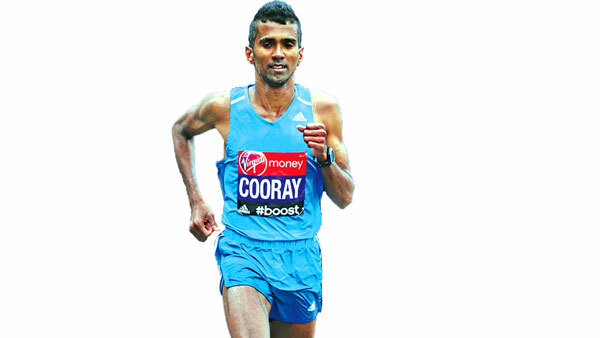 Last year has been one of the most fruitful for Cooray who came across the performance of his life at the 2015 London Marathon. Though he secured only 14th place, his career best timing of 2:13.47 in London was good enough to shatter a 40-year-old Sri Lanka record of 2:14.31 held by S.L.B. Rosa at the Fukuoka Marathon in 1975. Cooray 38 began 2016 by winning the silver medal at the South Asian Games in Guwahati, India. He has been training under Nick Taylor at Buckinghamshire’s Vale of Aylesbury Athletic Club whom he also represents at meets. Cooray is the most successful marathon runner the country has produced after the late K.A. Karunaratne, who competed at the 1992 Barcelona Olympics. The 38-year-old champion marathon runner will get the rare honour of carrying Sri Lanka’s Lion flag at the opening ceremony of the XXXIst summer Olympic Games to be held at the Maracana Stadium, Rio de Janeiro on August 5. Cooray is one of the three Lankans who had gained qualifying standards for Rio 2016 Games. He achieved this feat at last year’s London Marathon and the same performance enabled him to represent Sri Lanka at last year’s IAAF World Championships in Beijing. Shuttler Niluka Karunaratne, who was the overall captain of the Sri Lanka contingent for the last Olympics in London, will also be competing in Rio, along with swimmers Matthew Abeysinghe, Kimiko Raheem, women’s marathon runner Niluka Rajasekera, javelin thrower Sumedha Ranasinghe, judoka Chaminda Dharmawardena, rifle shooter Mangala Samarakoon and weightlifter Sudesh Peiris.